Selfies is the latest trend and almost everyone these days has heard of it and sometime engages too. 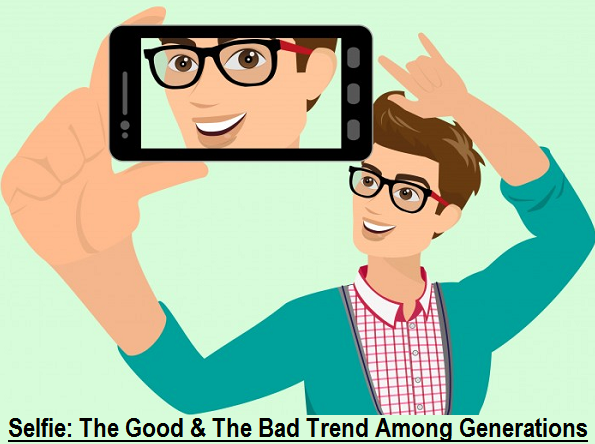 The selfie trend involves front camera of the smartphones and tablets to take pictures, afterward people share those images on various social networking websites. Google Plus (+), Instagram, Facebook and Twitter are seems to be the most popular social media site where people tend to upload their selfies according to a study. The study also stated that 1 million selfies are uploaded daily out of which 55% of them are uploaded onto Facebook. Below you will find Infographic on Selfie Trend and Culture Among Generations. It is also interesting to note that it is certainly the younger generation i.e. those born between the 1980’s and early 2000’s who engage the most in taking selfies of themselves. However it should be kept in mind that selfies have pros and cons as well and that there is a great amount of privacy which should be maintained as well. Prior to posting selfies online, it should be kept into consideration what the content of the Selfies is and that nothing is inappropriate, privacy should be kept at the highest level when posting selfies on social media and a good anti-virus should be made use of to prevent hackers or viruses from causing trouble. While selfies are a lot of fun and even celebrities are seen to be engaging in taking them, a number of them have also had to deal with their private pictures and videos being leaked so it’s always better to be safe and to make sure that privacy is at the top of the list. Below Infographic is developed by team "TheOneSpy".